The Department of Energy (DOE) has announced plans to use dedicated train service to transport spent nuclear fuel and high-level radioactive waste to Yucca Mountain. According to the June 18th announcement, railroad cars carrying nuclear waste will not share trains with any other cargo. DOE maintains that dedicated trains provide a greater degree of safety and security as they are easier to visually monitor and will spend less “dwell time” sitting in rail yards. By using dedicated trains, DOE expects train routing and scheduling to be more flexible and predictable. Transit times for waste shipments will also be reduced. 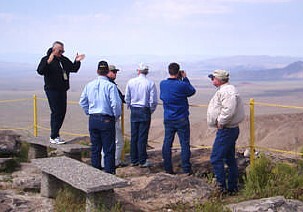 On April 27th, a group of Eureka County officials and employees took a tour of the Yucca Mountain Project. The group included Commissioners David Pastorino and Ken Benson, Sheriff Larry Etter, and Public Works Director Ronald Damele. Laurel Marshall, an employee of the Eureka County Yucca Mountain Information Office, and Tom Young, an engineer with Lumos and Associates, also attended. The tour was a chance for county officials who had not yet visited Yucca Mountain to get an up-close look at the repository project. The group drove down to Beatty the day before the tour and started out the next morning for Yucca Mountain. They were met by Bob Lupton, a representative from the Department of Energy (DOE), and Charlie Germack of DOE contractor Bechtel SAIC. The tour started with a trip to the crest of Yucca Mountain, where one could see the surrounding landscape, but get little sense of the massive project going on underground, according to Laurel Marshall. The tour then proceeded down into the tunnel where the participants were able to get a good look at the tunnel boring machine and ask questions about the project. DOE’s representatives only discussed general questions about Yucca Mountain. According to Laurel Marshall, the tour was informative and a good opportunity for Eureka officials to gain some perspective on the project. “It was a good chance for the county people to go to the site and get some idea of the physical appearance of the site – and the immensity of the project,” said Marshall. Government scientists conducting research on Yucca Mountain may have falsified data, according to a series of emails recently disclosed by the Department of Energy (DOE). Released to the public in early April, the emails imply that scientists may have made up details about how they conducted their research in order to appear to meet quality standards. The emails were written by scientists working for the U.S. Geological Survey (USGS), a part of the Department of Interior. The scientists were studying how water would move through a proposed nuclear waste repository at Yucca Mountain. Water infiltration is an important component in predicting how fast radioactive material would leak from a geologic repository. DOE has stated that the underlying science is sound and that the email controversy is unlikely to disrupt the current timetables for the repository project. Nevada officials, however, expressed dismay over the disclosure, questioning the accuracy of the science underpinning the Yucca Mountain Project and calling for an independent investigation into the matter. Several of the emails refer specifically to what is known as quality assurance, or QA. Quality assurance is a system of management controls that requires scientists to follow national nuclear safety standards. DOE’s QA system for the Yucca Mountain Project is based on Nuclear Regulatory Commission (NRC) guidelines. It is essentially a document trail that mandates employees and contractors to keep consistent, high-quality records of their work. The QA program plays a critical role in the Yucca Mountain licensing process, as it will be used by DOE to prove to the NRC that the proposed nuclear waste repository will function properly and meet health and safety standards. According to NRC spokeswoman Beth Hayden, quality assurance documentation is “supposed to give us confidence in the information” DOE submits to back up its request for a Yucca Mountain construction license. The emails in question suggest the scientists were producing work that would not meet quality assurance standards, and were occasionally falsifying information in ways they believed would satisfy the quality assurance inspectors. One message, dated November 1999, states, “In the end I keep track of 2 sets of files, the ones that will keep QA happy and the ones that were actually used.” Appearing pressured and frustrated with deadlines, the scientists indicate that they may have invented facts or deleted data that did not produce the desired result. Bodman affirmed, however, DOE’s intentions to continue work on the repository project. “It has been my judgment that until I see something that indicates the science of this project has been compromised, we’re going to go forward,” he said. The emails were released to the public by the House Federal Workforce and Agency Organization Subcommittee, which held a hearing in early April regarding the alleged falsifications. The subcommittee, which is chaired by Nevada Representative Jon Porter (R), summoned Energy and Interior Department officials to answer questions about the email messages. But Nevada officials, including Attorney General Brian Sandoval, disagreed. “Such falsification irreparably damages the legality of the project,” he testified. An official for the Interior Department said that two or three scientists were involved in writing the emails, which may have circulated to 10 people. The emails were dated between 1998 and 2000, when DOE was beginning assemble its scientific data in anticipation of making a site recommendation on Yucca Mountain. The disclosure has prompted investigations by the inspectors general of both DOE and the Department of Interior. The inspectors general are working on criminal investigations in conjunction with the Justice Department and the Federal Bureau of Investigation. A technical investigation is also being conducted internally by DOE to determine if and how the science may have been affected by the alleged falsifications. DOE disclosed the preliminary results from the internal investigation to NRC staff in early June. According to John Arthur, deputy director for the Yucca Mountain project, early findings of the investigation show the water movement studies to be technically sound. “The net infiltration estimates are technically defensible,” he said. Unsatisfied with DOE’s investigation, Nevada officials have called for an independent probe of the alleged falsifications. The House subcommittee chaired by Nevada Representative Porter has announced plans to hire a full-time investigator to lead an examination. The investigator will scrutinize the emails and analyze the management practices that may have led to the fabrication of data. The subcommittee has interviewed three of the scientists involved in writing the emails. 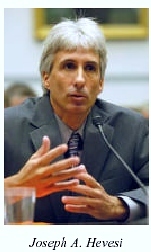 Joseph A. Hevesi, a hydrologist with USGS, was subpoenaed to appear before the panel after failing to respond to earlier requests. During his testimony Hevesi characterized the emails as “raw emotional responses” that merely reflected frustration with his work. “I have never falsified any documents regarding Yucca Mountain or any other project,” he told the subcommittee. 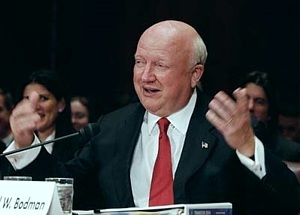 Two of the other scientists involved in writing the emails, Alan L. Flint and Lorraine E. Flint, have also been interviewed in person by the subcommittee. All three are currently assigned to the USGS office in Sacramento, California. 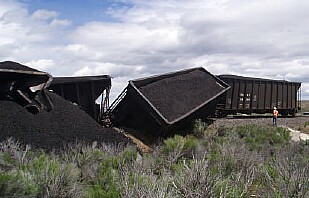 The scientists worked on the Yucca Mountain Project during the 1990s, contributing research and data to computer models that predicted rates of water flow through the proposed repository. The subcommittee also subpoenaed a series of Yucca Mountain project documents for review. DOE delivered 1,652 pages of information to the subcommittee in July, but failed to submit the draft license application, which was among the 10 sets of documents required by the subpoena. Eric Fygi, DOE’s acting general counsel, said the additional documents will be given to the subcommittee as “we identify and collect them.” The email messages came to light in December when contractors working for DOE were preparing documents for a license application for the proposed repository. The Yucca Mountain site must be granted a license by the Nuclear Regulatory Commission (NRC) before DOE can move forward with the construction and operation of the proposed facility. The license application was originally slated to be submitted to NRC by December 2004. Currently, DOE plans to announce a new target date for submission in August based upon its ability to prepare supporting documents in electronic format. It remains to be seen whether NRC will ask DOE to redo some of its scientific work as a result of the email disclosures. The Environmental Protection Agency (EPA) has released a new radiation protection standard for the Yucca Mountain Project. The EPA had initially stated its intent to release the new standard in September, but the announcement instead came early in August. The radiation health standard is one of the primary benchmarks used to ensure that the repository will be designed and built with adequate protections against radiation exposure. According the proposal, the EPA has created a two-part standard. The agency is keeping the original 10,000-year radiation standard, while proposing a different exposure limit for the succeeding period. Under the new standard, the surrounding population could not be exposed to more than 15 millirems of radiation for up to 10,000 years. After 10,000 years and up to one million years mark, the exposure limit is raised to 350 millirems. Nevada officials were dismayed at the new standard, questioning whether it will be sufficient to protect members of the surrounding community from exposure to the radioactive particles expected to escape into the environment. Joe Egan, – photo below – lawyer for the state, said, “this is far more outrageous than anything we even expected. If more than 15 millirems is harmful now, it is going to be equally harmful 50,000 years from now.” According to the EPA, 350 millirems is an appropriate number given the uncertainties of calculating radiationstandards so far into the future. “It’s a real scientific challenge, but we think we’ve done it in a way that is consistent with the best science,” said Jeffrey Holmstead, EPA assistant administrator for air and radiation. The EPA originally set its radiation safety standard for Yucca Mountain in 2001. Under the original standard, the Department of Energy (DOE) would have had to prove that people in the surrounding community would not be exposed to more than 15 millirems of radiation over a 10,000 year period. 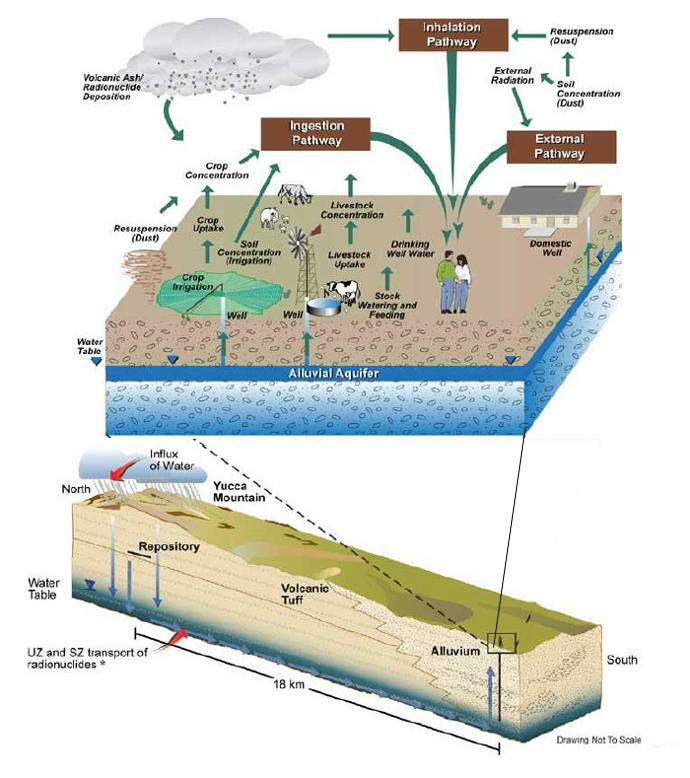 The rule included a separate four millirem standard for groundwater. In a 2004 lawsuit, the State of Nevada challenged this 10,000 year period, claiming it was both insufficient and illegal. The EPA is required by the Energy Policy Act of 1992 to base the safety standard on the recommendations of the National Academy of Sciences. The Academy, however, had recommended that the radiation safety standard be set to when the waste would be at its peak radiation levels – as much as 300,000 years from the time the waste is sent to Yucca Mountain. A U.S. Court of Appeals for the District of Columbia upheld Nevada’s claim, ruling that the standard was not “based upon and consistent” with the National Academy of Science recommendation. In its July 2004 ruling, the court vacated all Nuclear Regulatory Commission licensing standards that included a 10,000 year compliance period and ordered the EPA to come up with a new rule. Now that the EPA has completed its new standard, it will have to solicit and consider comments from the public. The EPA will have to evaluate public comments and make changes before the final standard can be implemented. Upon release of the rule, Nevada Senators Harry Reid (D) and John Ensign (R) sent a letter to EPA Administrator Stephen Johnson reminding him of a promised public hearing on the matter in Las Vegas. The senators also urged the EPA to hold hearings in Reno and Amargosa Valley and requested that the public comment period last for at least 180 days. This figure is an illustration of the setting of the biosphere in the context of the overall repository system. It shows the different pathways through which radiation exposure could occur as radioactive material leaks from the repository. Source: Yucca Mountain Site Suitability Evaluation, DOE February 2002 *UZ = unsaturated zone; SZ = saturated zone. The U.S. House of Representatives has voted to start storing nuclear waste at interim defense facility sites until the completion of the Yucca Mountain Project. The provision is included in a $29.7 billion spending bill for the Department of Energy (DOE) and the U.S. Army Corps of Engineers for Federal fiscal year 2006. The legislation does not designate a specific interim storage site. Instead, if signed into law, the bill would direct Energy Secretary Samuel Bodman to identify potential above-ground storage sites and start transporting spent nuclear fuel from nuclear reactors to one or more of these locations by the end of 2006. The legislation earmarks $10 million to support this process. “It is time to rethink our approach to spent fuel,” said Rep. David Hobson (R-Ohio), chairman of the House Appropriations Energy and Water Subcommittee. “This stuff is not in the safest place right now,” Hobson said. “This is a vision to move forward.” According to Hobson, author of the bill, the U.S. loses about $500 million every year that Yucca Mountain does not open. Congress originally directed DOE to have a nuclear waste repository up and running by 1998. The repository project, however, has been beset by delays and is currently not scheduled to open before 2012. Hobson presented interim storage as a way to shield the federal government from lawsuits filed by nuclear utilities. The government could be facing litigation worth billions of dollars for its failure to start accepting the waste by the 1998 deadline. “I’m trying to bridge that gap between the time that Yucca Mountain opens,” Hobson said. “We’re incurring a lot of litigation when we don’t get the spent fuel rods out from these power plants like we said we were going to do.” The bill also grants an additional $5 million to the Advanced Fuel Cycle Initiative, which directs DOE to explore the possibility of recycling the waste. According to the bill, DOE would have to research and designate a method of nuclear waste reprocessing by 2007. The reprocessing initiative is aimed at developing technology to decrease the amount of existing waste without creating dangerous byproducts or a quantity of more highly radioactive waste in the process. Scientists have said reprocessing could potentially wring more energy from existing nuclear waste while at the same time reducing the overall volume of waste that would have to be buried in a repository. However, despite these proposed initiatives, the Yucca Mountain project remains the centerpiece of the waste disposal strategy. The bill would fully fund the project at $651 million, $10 million more than requested by DOE. Nevada lawmakers were split on the measure. Representatives Jim Gibbons (R) and Shelley Berkley (D) voted against the proposal, while Representative Jon Porter (R) voted for the interim storage plan. Porter supported the measure in hopes that the focus on alternatives to Yucca Mountain will compel lawmakers “to understand that there needs to be other solutions” to the problem of nuclear waste. “The fact that they are looking at alternatives is a positive,” Porter said. Berkley and Gibbons, however, both oppose transporting nuclear waste anywhere from where it is currently stored: at reactor sites where it was originally produced. Berkley also said that interim storage would provoke opposition from any state designated to host it. “I predict within three years, this ridiculous notion will be dead,” she said. “Nobody will go for it.” Under the Nuclear Waste Policy Act, an interim storage site for nuclear waste cannot be located in Nevada. An effort in Congress to amend the law to allow temporary storage in Nevada failed in 2000. According to lawmakers, this vote marks the first time the House has ever supported the storage of nuclear waste anywhere other than Nevada. The bill has received a lukewarm reception by DOE and nuclear industry representatives, who believe the provisions may distract attention from the completion of the Yucca Mountain project. The measure must also pass muster with the Senate, where it has run into opposition. According to Senate energy and water subcommittee chairman Pete Domenici (R-New Mexico), a huge new interim storage plan for nuclear waste cannot be started with only “$10 million and a paragraph” of legislation.